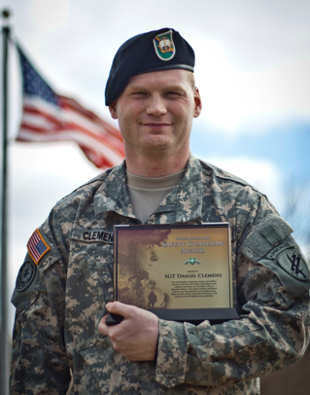 Daniel R. Clemens received the Army's Soldier Guardian Award on March 6, 2011 at the 308th Civil Affairs Brigade Reserve Station in Homewood, Illinois. Clemens is the first Soldier in the Army Reserve Soldier to receive this award for his actions in saving a woman's life while risking his own. HOMEWOOD, Ill. (Mar. 7, 2011) -- Army civil affairs Reserve soldier received a rare award for his actions in saving a woman's life. Sgt. Daniel Clemens had been waiting in line at a local gas station getting himself an energy drink when he heard a gun shot. “I was honestly thinking that if the [shooter] saw me, I would be the first target since I was in uniform, so I figured I would go see if anyone had been shot, to see what I could do to help,” Clemens said. Clemens is an Army Reserve civil affairs sergeant with the 308th Civil Affairs Brigade in Homewood, Ill., and was getting ready for their monthly battle assembly when he found himself inside the crime scene after a shooting with a large caliber handgun on 301st North Ridge Road in Minooka, Ill., making a choice that would change his life and save another's. Not only did Clemens risk his life by running toward the gunfire, but in so doing put himself in a situation to apply training he learned in the Army to save the victims life. “I served six and a half years on active duty as an infantryman, and I had practiced lifesaving skills a thousand times,” Clemens said, who had since left active duty to join the 308th in August of 2009 as a Reserve soldier. “We're very proud of him obviously, and I think he's a model for the other soldiers and citizens as well,” said 1st Sgt. Gregory Scott, the 308th first sergeant. “I could see a pool of blood below her upper leg. I quickly checked for an entrance and exit wound. Since I couldn't find an exit wound, I started treating the heavy bleeding. I knew that pressure alone wasn't going to keep her alive. At this point a trucker came up to help me, I had asked him for his belt and I applied makeshift tourniquet to her leg,” Clemens said. Gerard Watkins, occupational health and safety specialist for the 308th was a key advocate in pushing for the award when he heard about what Clemens had done, “I felt that his actions were not only very heroic, but also showcase the quality of Noncommissioned Officers we have in the Army.” said Watkins. His actions were also commended by the Minooka Fire Chief, Al Yancey, and his lieutenant, Shift Commander Arnold R. Nolan who had been at the scene. Because the shooters whereabouts were unknown, the area could not be cleared by local law enforcement, which in turn meant first responders couldn't enter the scene. It was during this critical time that Clemens was in action. “With quick action and disregard for his safety Sgt. Clemens remained with the victim applying direct pressure and remained there holding direct pressure to the victims wound until fire department personnel arrived on scene and relived him,” said Yancey in a written statement. Clemens is honored to receive the award but to him that‘s not the real reward, “I found out a month later [after the incident] that she made a full recovery from the shooting. That's all that matters to me, is that she's okay.” But perhaps the greater reward goes to his parents, “We feel [the Army Reserves] has also helped Daniel to be a better person, we are very proud of the young man he has become; and we are so proud he was able to help the victim,” said his mother, Susan Clemens.